Great white shark bites expensive camera. 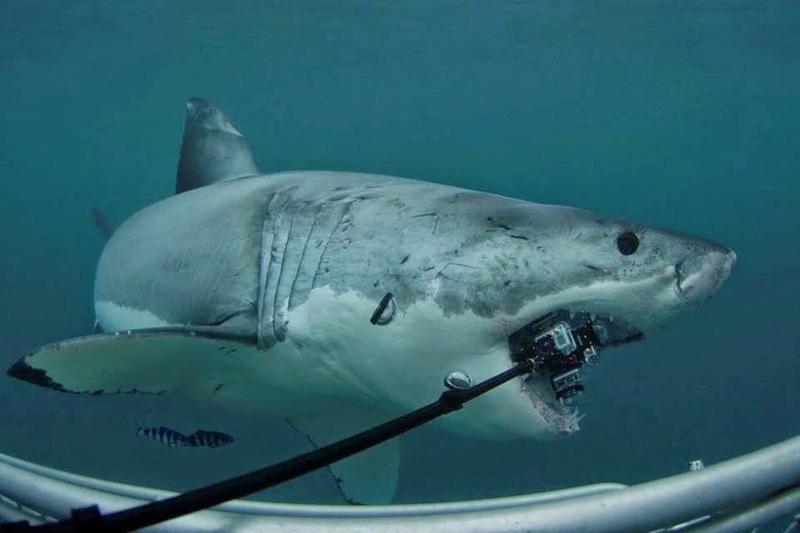 A diver in a shark cage attempting to get stunning underwater footage used a camera pole to place a camera in front of an approaching great white shark, which proceeded to bite the camera and dislodge it from the camera pole as if plucking an hors d'oeuvre off a toothpick. The 18-foot great white shark then spit out the camera, all to the dismay of the diver, as the camera was no ordinary camera. It was a 360Heros camera that captures revolutionary 360-degree video with six GoPro cameras and special underwater scuba domes. It was being used to take the first 360-degree video of sharks. All the camera gear, SD cards, and historic footage sank to the bottom of the ocean off New Zealand. Along with posting the video, Kintner posted a $5,000 reward for the person who retrieves the lost camera rig and its stunning footage, or what we assume to be stunning footage. Kintner told Right this Minute that the diver wasn’t able to fetch the camera himself because another great white shark was playing with the camera below the cage farther down. Kintner also said they learned they need to make the unit buoyant so it would float next time, and to remember putting on a safety cable. That's a pretty hefty reward to just dive down and grab the camera with some scuba gear.